Hes the Phil JAckson of players. he goes to stacked teams. When "fill" joined us in 2000, we weren't a stacked team. Had a bunch of unproven role players (except Horry) and a team that had playoff/chemistry issues and a highly explosive divide between shaq and kobe. It was no slam dunk situation. Same when he rejoined us in 2006. We didn't have Pau. Only Kobe, a poor #2 option in LO, and a bunch of crappy or young roleplayers. I'm starting to lean towards Lebron going to the Rockets. If he stays in the east he could lose the to Celtics every year. Lebron going West would be a breathe of fresh air tho he would be joining a loaded team. Still don't think they can beat a healthy GSW. I don't see any team taking both Anderson and Gordon. Maybe one team takes either one with future draft picks going there way. If not, someone would have to take a massive paycut. Maybe Lebron is that gutless. They can't keep D'Antoni if he comes either. Chances are he will get fired after this series if they get swept or lose in 5. They will have to find a puppet for Lebron. Don't see any real coaches available. I don’t see big difference between picking Houston or LA, playing with CP3 and Harden is just as enticing as playing with PG and Jules or PG and Kawhi... we have so much flexibility to convince LeBron to join that I’m surprised you would think he’s leaning toward the Rockets.. It is a noticeable difference. CP3 and Harden are proven playoff players and veterans that still have lots of game. Yes, they have never won rings (and won't this year either) but they are far more proven players than PG , and a young Randle and Ball.. who haven't done anything in this league yet. One team is "finals ready" in Houston and another team (Us) would just be very talented and Lebron would have to work towards leading that team. Some of the LeBron takes in this thread, in my opinion, are just stunningly off. Damn. The guy completely gave up and threw away an entire season during the Finals just so Wade wouldn't get the credit if they had won Yeah, that's totally plausible! Low-level stuff like this just doesn't deserve serious engagement. I don’t understand why people with trash heap takes like that even bother posting here. Haven't heard stuff as bad as this since high school. It's still a matter of what LeBron wants to do. If he calls any team besides GS I'm sure they're going to find a way to make the room for him. He's not uprooting his family to play anywhere, regardless of salary or teammates, imo. It's either Cleveland or Los Angeles or maybe New York. It doesn't matter if they want to find ways to make room for him. There simply isn't a way for most teams to shed the necessary contracts to get him. Want and ability are two different beasts. "But perhaps more importantly, we have to consider the impact off the court. LeBron apparently wanted the Cavs to get DeAndre Jordan, and in a rare turn of events, the front office went against his wishes. Will that impact his looming free agency decision? It certainly could. But, of course, we won't know the answer to that until July." LeBron already has all bases covered when he leaves the Cav's again come July. Seeing how bad their D has been and how Thompson isn't the same, Lebron may have been right to want him. He couldn't have hurt. Of course, though, Cleveland would have been saddled with Jordan's deal next season after Lebron has left anyway. The Cav's were in a loss-loss situation, get DJ for a short term fix, but risk losing both LeBron and DJ, who could opt out, while losing the 2018 lottery first rounder from the Nets. But, the Cav's could have gone all out in trying to appease LeBron and give him any extra help ASAP, as DJ actually has dominated the Celtics in the past few years, and he would have been huge in helping the Cav's get past the Celtics in the ECF. Plus, they would have shed that Thompson contract as well in the process. But, imo Dan Gilbert is ready this time when LeBron leaves, unlike when he was caught off guard completely when LeBron left in 2010. Now the Cav's have some young players to go along with the the number 8 pick in the draft to build something with now if/once LeBron leaves this time now. LeBron wouldn’t even sign a extension if they traded for PG. That was pretty tellling on what he is doing this off-season. Assuming that LeBron hasn't made up his mind already, and it's a legit race for his services, my gut is that we're a very slight favorite, but I can really see any of the 3 of Houston/Philly/Lakers getting him. All 3 offer compelling situations. Houston is ready made to win a championship. His naysayers will say he just joined a ready made team. 76ers have 2 all-star level players. His naysayers will say he was scared to come out West. Lakers have the possibility of adding an all star in PG13, plus a crop of promising young players who can support him. Plus it's the location that is most favorable. July should be very interesting. Pg13 is really the key. If he signs, I am confident we can get a second max either this year or the next. In PG13's case, his weakness is actually a strength for us, the fact that he is a really good player but not a first option on a championship team. Attracts FAs who want to be that first option but still want a talented cast to be around with. If he doesn't, then we just have to continue the rebuilding process. Am I the only one who isn't convinced that what the naysayers would potentially say won't drive his decision much, if at all? I just don't see him feeling pressured to sign with either LA or HOU to avoid the claim that he’s scared to death of playing in the West. To whatever degree that such criticism might bother him, would it bother him enough to influence his decision in a meaningful way? I doubt it. I mean, I don't think he particularly enjoyed the ”villain” image he had for a little while when he left CLE the first time, but I do think it cemented a self-security with making his own decisions and being at peace with those decisions, regardless of naysayers. Even after returning to CLE he’s admitted that his family didn't even want him to, particularly because of Gilbert’s letter. He still did it. We’re not talking about the guy who made the burner account to defend himself against strangers online. James is not insecure. He does what he wants and embraces the results. He’s as well aware as we are that a lot of people already have their minds made up about him and what his legacy should be. They've put asterisks on all of his championships to one degree or another ever since he won the first one. He's the face of the modern ”super team” movement, and that's irreversible. It’s forever attached to his name no matter how his career ends. The only way I can see him avoiding the usual naysayer talk is if he stays in CLE. Even if he were to sign with the Lakers people would probably accuse him of no longer caring about winning. So regardless of wherever he decides to go next, I don't think it'll be significantly influenced by the naysayers. He’ll sign up for whatever situation he likes the most and checks all the boxes. He is very deliberate about his image, brand, and yes, IMO, his basketball legacy. The final chapter is entirely up to him. I don't think it's a predominant factor, but a factor. I mean, he could sign with the Warriors on the MLE, but he wouldn't, b/c history would not look kindly on him for that. Of the likely top 3 teams, it could come down to the smallest of factors in his decision. In terms of drama, lebron would salivate at the chance of avenging Boston next year and Kyrie while being a Laker. There will be no better story line next year tHan that. Assuming Boston wins, lebron will hear it all summer about despite his best performance, his crappy teammates let him down and lost to a depleted Boston squad (who in turn will probably be swept by GSW). Lebron is all about the money and all about the drama. Next year, Lakers vs Celtics can truly be revived with King James and PG at the helm! Let’s face it, lebron is NOT getting 6 rings to catch MJ. he already won the admiration of east coast fans, and of course, his home city of Cleveland. However, many people doubt him as GOAT bc he has been in the east his entire career. I think if he wins just 1 more title in the West, while dethroning GSW at the same time, he would unequivocally be considered one of the GOAT (behind MJ). And that’s alright with me. The story line is so perfect it's hard to believe it isn't pre-determined. I have to admit, despite not being a LeBron fan, I would pay money to see that. I think we’re basically saying the same thing. I do acknowledge that people’s perception of him is a factor since perception obviously impacts a player’s legacy. For him uniquely, though, if he were to choose the Lakers over Philly (since many of us believe it'll probably come down to those two teams), I don't think the argument that he's afraid of playing in the West would push the Lakers out in front. 1) Returning to your own hometown, who burned your jersey when you left, and delivering on your promise of ending their historically long playoff drought by coming back from a 3-1 deficit in the Finals against the team with the best regular season record of all time. 2) Finishing the twilight of your career (ala Wilt, as you’ve very astutely compared) in Los Angeles and leading them to two championships, pushing them ahead of the Celtics for the most all-time. And let’s be honest, odds are, the Lakers would likely have to beat Boston at least once. LeBron leading the Lakers to a championship over Kyrie in a Celtic uniform would add another epic chapter to the rivalry. He can win another title or two in HOU or PHI, but in terms of how it would add to his legacy, neither would come close to the Lakers scenario. In short, I just think the above would be closer to his line of thinking this summer while he deliberates on where he goes next. I think he’ll approach it from more of a positive viewpoint like that as opposed to worrying about naysayers. In short, I just think that this would be closer to his line of thinking when factoring in his legacy while he’s deliberating on his next move this summer. I think he’ll approach it from more of a positive viewpoint like that as opposed to worrying about naysayers. He's in rarified air. No one thought anyone could touch MJ at #1 but he's at least in the same zip code. I think he will (or has) carefully think about all facets of his next destination, including how it will be written about in the history books when he retires. 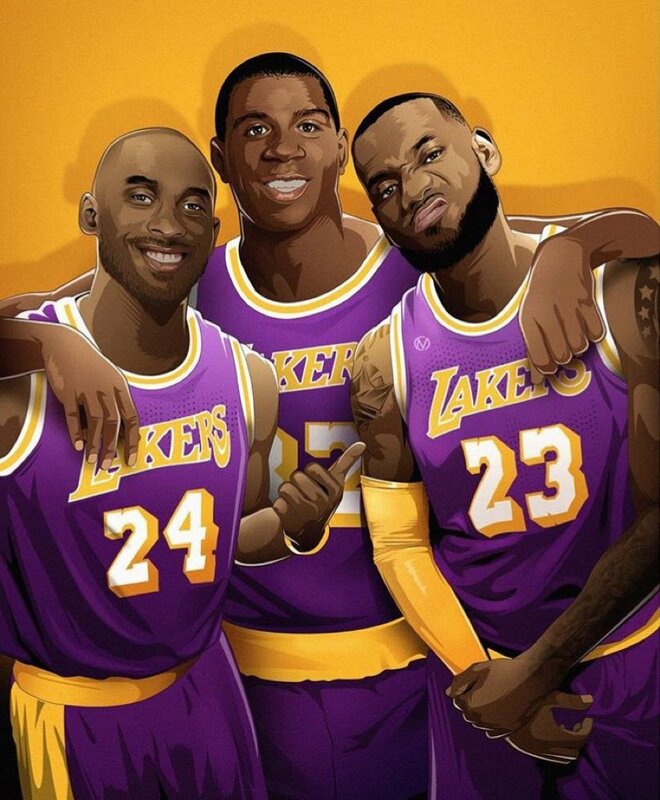 More difficult but possibly more rewarding legacy-wise path to a ring = Lakers.